This book was all over the map and not at all what I’ve come to expect from J.R. Ward. The blurb says that this story is about Payne and Manny but really, it’s about Vishous. I felt that a lot of the other characters got cheated in this installment. Tohr was completely absent, as was Murhder, which surprised me considering he just made his presence known in the last novel. There’s also a weird serial murderer subplot that doesn’t quite fit and a new gang of vamps is introduced. In short, Lover Unleashed felt like a mishmash of leftover bits from previous books thrown together in an attempt to tie-up loose ends while at the same time introducing new storylines to help steer this series in a new direction. I was very disappointed with how Payne’s character was portrayed. I expected her to be a strong, female warrior similar to Xhex but instead she comes across as a weak, malleable Chosen. The fact that she’s confined to a bed for the bulk of this story doesn’t exactly help nor do her suicidal tendencies. I get that her situation seems dire but she could have at least TRIED before throwing in the towel. I didn’t like the way that Ward addressed her potential handicapped state either. Being confined to a wheelchair is indeed a life-changer and it probably takes years to adjust but plenty of disabled people still live long and fulfilling lives. The way J.R. tells it is that you’re better off dead than in a chair. Manny is lovable at least; I enjoyed his interactions with Jane and his confrontations with V but other than that, his and Payne’s relationship left me feeling lukewarm. The ending of Lover Unbound left something to be desired so I was happy that Ward chose to revisit V’s story in this book. The unexpected revelation that he not only has a sister but that she’s been held prisoner by their mother comes as quite a shock and throws him into a nasty downward spiral. Jane tries to ease his pain by taking Vishous’ heavy burden onto her own shoulders but this ends up backfiring and the only one who can pick-up the pieces is Butch. Fans of this series know that sexual tension has been building between these two brothers since day one and in this installment it finally comes to fruition but not in the way that you might think. You know the saying: “you always hurt the one you love the most”? Ward puts her own unique spin on it and the result is both heartbreaking and freeing; definitely one of the more memorable scenes of this series. In a series that’s been around for as long as Ward’s Black Dagger Brotherhood has there’s bound to be one or two subpar books and unfortunately Lover Unleashed is one of them. It wasn’t horrible but it wasn’t very good either. I guess even J.R. is allowed a mulligan every once in a while! 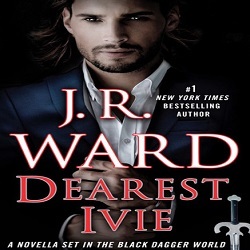 Recommendation: Good for BDB fans who are looking to experience Ward’s world from a female’s POV. Like this, like that: The Sweetblood series by Laurie London, the Demonica series by Larissa Ione and the Night Huntress series by Jeaniene Frost. Interesting take, and I can definitely see your points, and now I’m wondering, does the narrator makes that much difference in my enjoyment of these novels? I loved this one, but then again I have love every of her books on audio, funny tho. that wasn’t case on print. @Loupe Duffy I think the narrator can make a HUGE difference sometimes. *phew* So I’m not the only one who thought it wasn’t the usual Ward-like BDB book. But, as much as I love V and as much as I wanted to see him and Butch go at it before they found their mates, I can’t help but say I really wanted this to be Payne’s and Manny’s book. That’s what it says on the synopsis and that’s what I wanted. Can’t wait to see what you think of Tohr’s book.